Monroe County was established May 15, 1821, on land acquired from the Creek Indians. The county is named after President James Monroe and is approximately 396 square miles. The population is approximately 25,000, mostly living in rural areas. The largest city, Forsyth, is also the county seat. 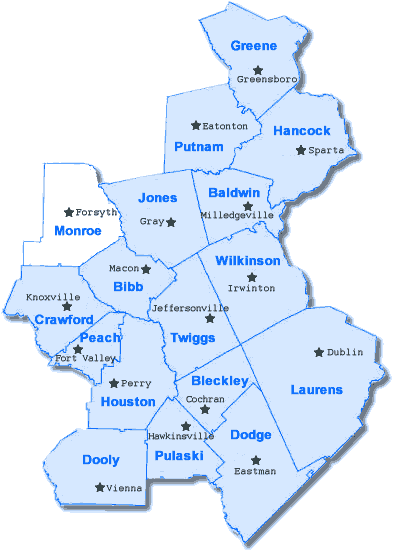 Monroe County is surrounded by Bibb, Jones, Jasper, Butts, Lamar, Upson and Crawford Counties and includes the cities of Bolingbroke, Culloden, Forsyth, Juliette and Smarr. Monroe County is the location of High Falls State Park. This 1,050 acre park offers a waterfall, 4.5 miles of hiking trails, picnic area, campsites, fishing, swimming pool and canoe rentals. The park's location, 1.8 miles east of I-75 (Exit 198), makes it a convenient stop for relaxation. There are two public boat ramps and there is a 10 horsepower limit for boat engines. The parks hours are 7AM - 10PM. The county also contains Lake Juliette. This 3,600 acre lake is the Georgia Power reservoir that provides cooling water for Plant SchererÃ¢â‚¬â„¢s electric generating facility. The lake is a popular fishing and camping area. Lake Juliette has two public boat ramps and there is a 25 horsepower limit for boat engines. There are two parks, Holly Grove Park on the northwest side of the lake and Dames Ferry Park on the lower portion of the lake. Holly Grove Park has twenty-five acres including a boat ramp with parking, dock and picnic tables. Dames Ferry Park has a full-service campground, boat ramp with parking, picnic tables and grills. The Georgia Public Safety Training Center, located in Forsyth, is the main site of public safety related training for all state and local public safety related units of government within Georgia. It's purpose is to provide the most current, high quality, cost effective training. The facility is used by such units of government as law enforcement, corrections, fire service, 911/communications, coroners, emergency medical service and judicial personnel. Are you relocating to Monroe County GA? Get your FREE relocation package!